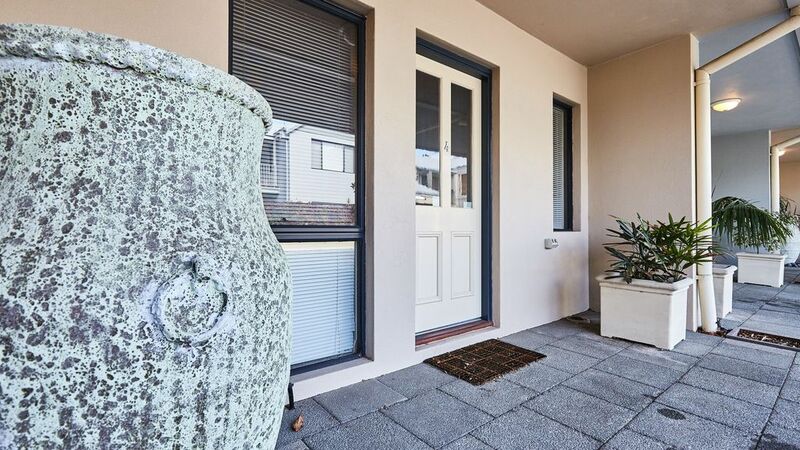 WALK TO EVERYTHING IN FREMANTLE...There are 3 upmarket,, 2 storey Townhouses in the Freo Mews boutique complex, with living room, dining, kitchen, laundry/bathroom and private courtyard on the ground level, all units are 2 bedrooms. Up the stairs to the spacious bedrooms with en suite bathroom and large balcony. Tariffs from $129/night. Every comfort, TV sets on each level, air-conditioning, security entrance, parking at your door. Please note the above prices are for 1 or 2 guests, for Twin share (use of both beds) please add $40 per night. Freo Mews is in the heart of Fremantle, a short walk in any direction to all the sights, shops and facilities. The nearest restaurant, very good coffee shop and best Italian supermarket in Fremantle are all within 100 metres; our excellent swimming beach is 800 metres. Freo Mews excellent in every way. Great apartment ,very clean and in a excellent position,and the bonus very secure parking which is not always avaliable in Frmantle. Thanks David for the great stay. We had a lovely few days in Fremantle. The apartment is in a prime location with the Freo Cat bus (free transport around Fremantle) stop right outside the door. The apartment was clean and comfortable. David was very helpful. I would highly recommend this apartment to anyone travelling to Fremantle. We loved the place.Near everything.Beautifully maintained. We will definatly be back.Thank you to the owners. We enjoyed staying at Freo Mews Executive Apartment Unit 4. It was clean and very central. Walking distance to all shops and places to eat. Not very far from the harbour when you want to take a stroll. David was constantly in communication with me and answered all my questions. I would definitely recommend the property. The weather was very windy and cold so we couldn't use the balcony or the little outside setup! My friend and I were looking for a central spot for a weekend girl's getaway. This property was within walking distance of markets, the strip, restaurants and wine bars. Clean and neat and had everything we needed. Would definitely stay again.